Is Vertical Integration For You? So you’ve had a great idea to service a segment of the market by supplying products, services or both. Before “rushing to market” stop and think how much of the product or service you should take on. By 2014 the benefits of “sticking to core competency” and outsourcing the rest is extoled. However, that’s not always the best answer. It is smart to examine the impact of being more “vertically” integrated. 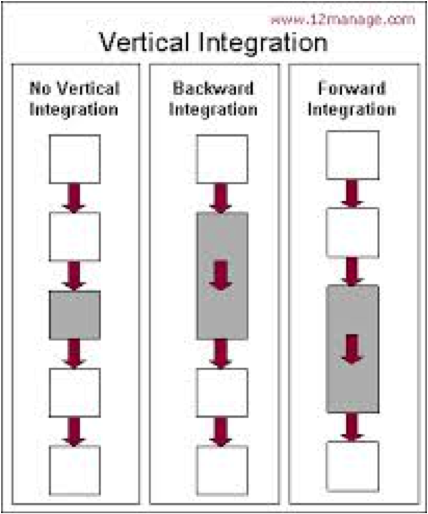 You can be backward integrated, forward integrated or both. A vertically integrated company owns and controls its supply chain. Being vertically integrated can be quite demanding. The question always arises, how far back and forward should our integration be? An example will help. Let’s use an extreme example to make the point. Say you have uniquely solved a problem that exists in the marketplace. You decide to manufacture the products, sell and distribute them. There are many “plus” and “minus” factors that will affect your “how integrated should I be?” decision. So how does one decide? First of all, play to your strengths. Consider your company strengths and assets as well as the average needs and values of the customers you intend to serve. And be sure to factor in actual or would be competitors. Your existing teams strengths and weaknesses should be a strong determinant of what you keep in-house and what you outsource. For example if your team has engineering, technology and manufacturing expertise you might favor backward integration after analyzing outsourcing alternatives. Remember that having the skills just mentioned will be required to not just do it yourself, but to create the right outsourcing contracts and to manage quality deliveries. Customer value largely depend on the expectations of the demographics of the market segment you are serving and how you want your product “to be seen.” Take Apple and Samsung. They are both top of the line suppliers. Apple focuses on style, status and adjacent product integration with its multiple offerings. Samsung wins in the commodity purchase domain with the least dollar per function. Apple is very heavily forward integrated given its direct retail presence. Samsung is not. The questions to ask relative to competition are about differentiation and price points. Will end-to-end supply chain ownership offer enough perceived value to justify higher pricing? Or will price be the main factor the buyer is willing to consider? Again, this is about knowing your market. Focus groups and surveys can help you know how the market will respond. Like many business decisions there are multiple possibilities. I hope the foregoing has outlined factors that help you decide what’s best for you.